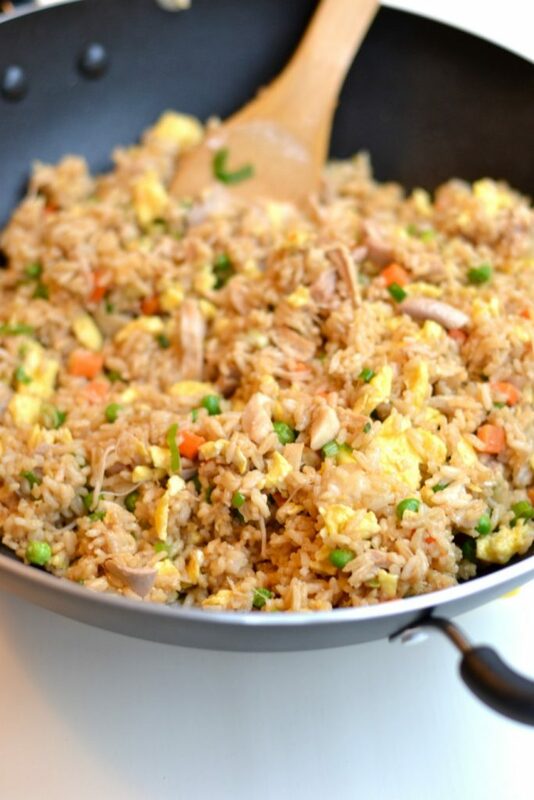 It’s so easy to make delicious fried rice with egg at home. You only need a handful of ingredients, which you can find in any grocery store, and it’s a great way to use up leftovers. My 8-year-old daughter knows good food. When her favorite Italian wedding soup was discontinued a few years ago, I was inspired to create my own version, which has become a staple in our house (and the most popular recipe on this blog to date). Recently she’s adopted a new favorite: fried rice. The first time she tried it a local restaurant, she was immediately hooked. She’s had it at many different restaurants since then, but the fried rice near our house has remained #1. AND it’s customizable. You can swap in/out any protein or veggies you like, making it a fantastic way to use up leftovers. Another thing I discovered when I made my own fried rice is that it’s a lot healthier than I realized. The word “fried” always led me to believe that the rice was drowned in oil, but in my homemade version I only used two tablespoons of canola oil for several cups of rice. And adding scrambled eggs gives it a great texture, and an inexpensive way to add protein. After I made this fried rice the other night, my daughter declared my version her new #1. If you knew how particular she is about her fried rice, you’d know that’s a huge and hard-won compliment! 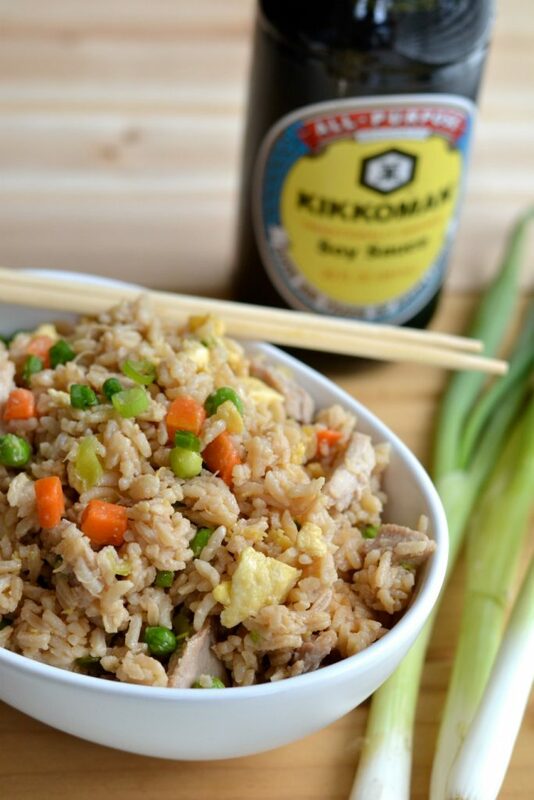 Since my fried rice won such rave reviews, and it was such an easy recipe, I decided that it needed to go on the blog. Do you need a wok to cook fried rice? The first time I made it, I used a regular stainless steel skillet because we didn’t own a wok. The end result came out tasting great, but I did have a hard time preventing the rice from sticking, and clean-up was a bit of a pain. Once I realized that fried rice was going to be our new weeknight staple, I did decide to buy this inexpensive wok, and it made the cooking process MUCH easier the next time around. For $25, I thought the wok was a worthwhile investment since I’ll be cooking fried rice often, and I also enjoy making chicken stir-fry and other Asian dishes. So the short answer to the question is: sort of. I wouldn’t go out and buy a wok just to make this dish…a large non-stick skillet should work fine. But if you DO plan on cooking fried rice, stir-fry, or Asian noodle dishes with any regularity, then a wok will make your life a whole lot easier. Before I get to the printable recipe, there are a few cooking notes I want to share. What type of rice is best for making fried rice? Fried rice can be made with regular long-grain white rice, but the rice needs to be COLD before you cook it. So if you’re planning to make fried rice, either cook the rice a day or two ahead, or cook it in the morning and put it in the fridge until dinnertime. You can also use leftover rice from a restaurant or take-out order if you have some on hand. There are lots of substitutions you can make in this recipe. You can swap white rice with brown, you can use any sort of protein you like (chicken, shrimp, pork, steak, tofu, or a combination), and you can add in a wide variety of veggies. I prefer to buy the frozen pea/carrot mixture because that’s what was in my daughter’s favorite restaurant version, but you could also use corn, green beans, edamame, broccoli, or anything else you have in your freezer or fridge. You can also choose to omit the sesame oil if you prefer your fried rice without sesame oil. If you like a little heat, drizzle some sriracha over your finished fried rice before serving. It’s a delicious way to add flavor and spice. 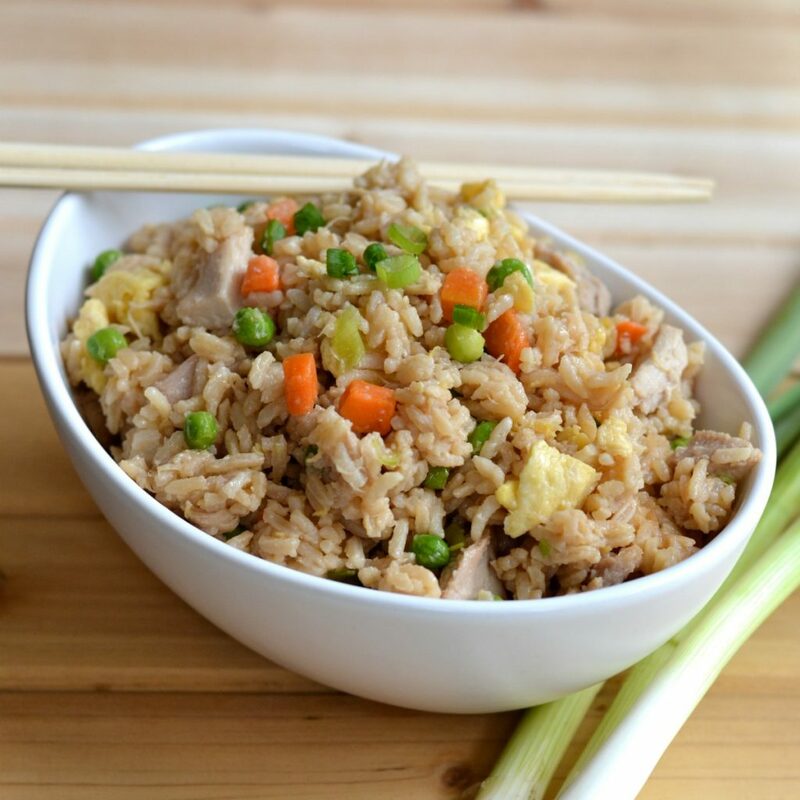 This easy fried rice with egg only uses a handful of ingredients, yet has all of the deliciousness of your favorite restaurant's fried rice. Heat a skillet or wok to medium-high heat. Add 1 tbsp canola oil. When oil is warm, add the eggs and cook, scrambling. Remove to a platter and set aside. In skillet or wok, heat to medium-high. Add 2 tbsp canola oil. When oil is hot, add cold rice and 1/4 cup of soy sauce. Stir constantly with wooden spoon until rice is evenly coated in soy sauce and hot, adding more oil if necessary to prevent sticking. 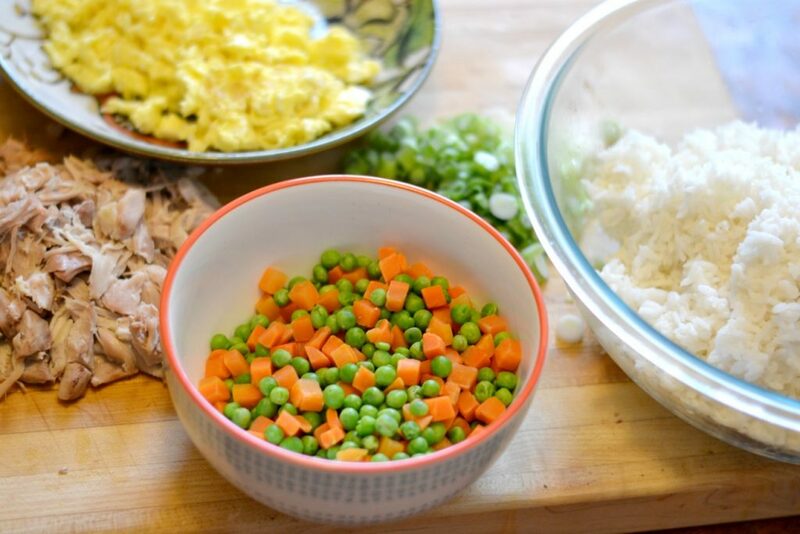 Add meat/seafood (if using), cooked egg, chopped scallions, peas and carrots and sesame oil. Stir until everything is combined and hot. Add more soy sauce to taste as needed. *I prefer to microwave the veggies so that they're just slightly undercooked, and can finish cooking quickly in the wok/skillet. My package said to microwave for 4-6 minutes, and I cooked for 3.5 minutes. *If you want to add some heat, drizzle sriracha over the fried rice before serving. 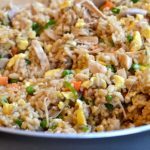 Fried rice is a great meal prep food we found. Especially on those busy weeks where we know we won’t want to cook. fried rice is SUCH an underrated dinner idea! seriously, what’ not to love it’s so so easy and delicious! Your version looks amazing and is making me SO hungry right now!